Rosie Nixon has a fabulous job as Editor-in-Chief of HELLO! the go to magazine showcasing the glamorous world of celebrity, royalty and fashion. Prior to this role she held various prominent positions at a variety of women’s magazines including Red and Grazia. Many KV mothers will relate to Rosie. Like us she is a busy mother with young children constantly juggling motherhood and family life with career commitments and a busy social life. I must confess HELLO! is one my guilty pleasures. The latest edition is always available at the spa where I have my nails done – first thing I pick up when I walk in! As guilty pleasures go a lighthearted paperback is also up there. 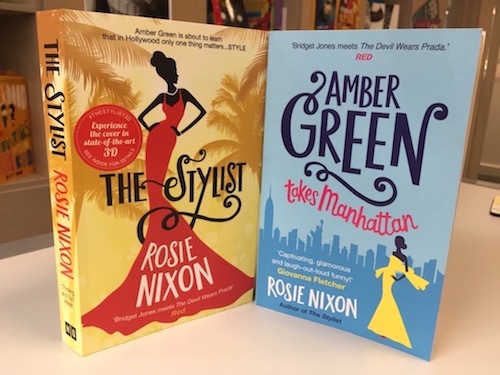 If you are looking for something fun to read on the beach at your next holiday Rosie’s latest novel, Amber Green Takes Manhattan, should certainly fit the bill wonderfully. The book tells the story of Amber, a stylist in a London department store who moves to New York to join her boyfriend and embarks on a determined mission to succeed across the pond. With this book we get a fascinating insight into what goes on behind the scenes at fashion shows. This is a fabulous light-hearted read that should brighten up your day. HELLO! Editor-in-Chief sounds impossibly glamorous. Describe a typical working day. "Every day varies at HELLO!, and this is one of the reasons I love my job so much. However, the thing that remains constant, is the 6.30/7am wake-up call from my two children who have recently formed a habit of taking themselves downstairs, while my husband and I are still waking up, and mixing up ‘potions’ from the cooking cupboards. We are trying to curtail this ritual because the clean up operation is becoming far too time consuming! We have breakfast together and I might pop to the gym for 30 minutes if there’s time." Click HERE to read the full interview in our members' Library. Amber Green Takes Manhattan £7.99 is published by Harper Collins. Available from Amazon.